Underwater loan owners with payments exceeding rent have a moral imperitive to strategically default to provide deterence for banks to inflate future housing bubbles. The fear of strategic default is a necessary deterrent to foolish lending. Without it, lenders are emboldened to make all manner of bad loans because they believe they will get paid back. Lenders will make nearly any loan if they believe they will get their money back with interest. It's only when they feel they won't get repaid are they prompted to loan responsibly. Some have questioned how I can be so against debt, yet I am leveraging up to the max to buy cashflow properties in Las Vegas. Isn't that being hypocritical? I had the good fortune to meet a gentlemen who provides asset-backed debt from a major lender. His company provides debt for property, plant, and equipment to other major corporations. When he analyzes the collateral for a loan, he considers it's useful life, the recovery and resale value, and the cashflow the asset may generate (if any). He assumes the debtor's word means nothing and any recovery of capital will come solely from the collateral pledged to cover the loan. In his world, there is no signatory assurance of repayment. There is only collateral repossession, cashflow, and resale. Asset-backed debt is essential to the functioning of our economic system. Many businesses could not raise the equity to obtain the property or equipment necessary to it's operations. Lenders can loan against working capital at very low rates with little risk. If businesses have their money freed up to grow the business, our economy grows and prospers. In short, asset-backed debt is useful and freeing. On the other hand, signatory debt is slavery. Signatory debt is money given to a borrower simply based on the borrower's promise to repay. It has nothing to do with an asset, and if the borrower chooses not to repay, recovering signatory debt can be very difficult because it is not backed by tangible collateral. Signatory debt provides no useful purpose. It provides a short-term economic boost as demand is pulled forward, but once it is consumed, money that would ordinarily have been spent by the borrower on consumer goods is instead diverted to the lender for debt service. It's only when signatory debt is expanding that the economy is stimulated. The expansion of signatory debt is a Ponzi scheme. The problem with signatory debt is simple: people don't want to keep their promise to repay when it is inconvenient. Ponzis live to consume. They will take money under any terms offered, and when it comes time to pay the bills, they will seek more borrowed money to keep the system going. Borrowing money to repay debt is the essence of Ponzi living. Has anyone been watching events in Greece unfold? Once lenders cross the line from asset-backed debt to signatory debt, they are inflating an unsustainable Ponzi scheme. Inevitably, prices will crash back to asset-backed levels determined by rental parity. it's not a matter of if, only when. We are seeing this play out across America right now with the deflation of the housing bubble. If borrowers don't default, if lenders are given a free pass to make another generation insolvent, then we have failed our children. We are sentencing them to live in a world where lenders enslave them through excessive mortgage payments to afford properties comparable to rentals. The next time you read or hear that borrowers who default are being immoral, ask yourself who is really being immoral, the lender or the borrower. In my opinion, it is the lenders who were immoral when they inflated the housing bubble and over-burdened borrowers. The borrower who strategically defaults is behaving morally by doing what's best for their family. If congress does not take action, and I hope they don't, September 30th is the date these homes will be governed by the private market, with interest rates likely being higher. While I don't like to see housing values decline, because it hurts people who have worked hard to attain their status, housing should not be inflated artificially. Housing should be shelter first, and an inflation hedge second. It should never be a speculative commodity, rising faster than inflation, because it is too important to the nation. If the decline in price for these houses becomes a long term reality, then many more people could afford to buy these houses for a long time into the future, and they would have more discretionary income than some owners have now. Their wealth would be founded upon a sound market and not on the shifting sands of speculation. It's simple math. If a smaller portion of a wage earner's salary is diverted to housing costs, particularly interest, then money is freed up to be saved or spent on other things. Mortgage debt is a drain on the economy. People in New York, Massachusetts, California and other high end regions should brace for less demand and higher interest rates for mortgages above the conforming limit. This is the jumbo mortgage arena where less demand has already caused a decline in house prices. But perhaps we haven't seen anything yet, as people will flee the higher rates until the prices themselves bottom out. I predict a wave of strategic default at the $750,000+ price ranges. Many of these borrowers were Ponzis who were only holding on because they believed prices were coming back. Once they realize the demand is gone, and it may not come back in the next decade, why would they keep making the oversized payments? After all, the plan was to live off the HELOC booty and appreciation, and that isn't going to happen. I expect Orange County delinquency rates to rise along with the rest of Coastal California. Back in 2007 and 2008, we would marvel at 2004 rollbacks. Those only represented about four years of zero appreciation. However, as the housing bust has dragged on, prices keep rolling back, and the dead time of zero appreciation has not extended to over eight years — and it will get worse. Buyers from 2002 and 2003 are facing resale prices that often barely cover their sales commissions. There certainly isn't enough gain to compensate them for the additional cost of ownership they paid during the years of bloated mortgage payments. Also, inflation has eroded the value of money over the last eight years, so on an inflation adjusted basis, they are certainly behind those who rented instead. Appreciation is supposed to justify making excessive payments. When it doesn't materialize, the people who opted for oversized loans played the fool. Banks are the beneficiaries along with realtors, mortgage brokers, and the former owners who obtained a windfall. Slow steady gains in the housing market are much preferable to periods of boom and bust. If home prices were tethered to incomes through sane debt-to-income ratios and stable interest rates, homeowners would steadily gain equity, and none would be facing the terrible problems they are today. The goal of government policy should not be to maximize borrowing to save the banks and preserve loan owners illusions of wealth. The goal should be stable home prices and sound lending practices to sustain home ownership and preserve disposable income to sustain a consumer economy. The owners of today's featured property paid $253,000 back on 1/28/2003. They borrowed $202,400 and put $50,600 down. The opened two HELOCs in late 2005 for $50,000 and $59,000, but there is no evidence they borrowed this money. Although they are now in default, these were not foolish borrowers who spent their home. They were merely unfortunate enough to have overpaid for a property in the price segment banks have been foreclosing on. Their property values have been pushed back to rental parity levels while their more affluent neighbors have been allowed to squat. 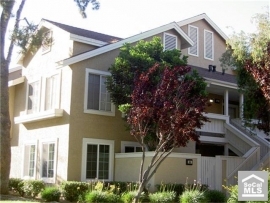 Wonderful, convenient upper condo-walking distance to the South Lake & lagoon. Nearby is Woodbridge High, Meadow Park Ele and South Lake Middle schools, shopping, Irvine Spectrum, Gelsons, Albertsons, Office Deport, Ace Hardware–restaurants. Great location and cute 1-level condo with 2 bedrooms and 1 full bath plus 1/4 ba (dressing area & sink) in master bedroom. Could look into adding a shower in master/may be room. Resort-style living, Woodbridge is THE master-planned community! Investors will love the ease of leasing in Woodbridge, evryone will enjoy the great lay-out of large living room, separate dining room open to the kitchen, inside laundry hook-ups and 2 generous-size bedrooms. Another condo at or just below rental parity. Does that make it an enticing purchase? How much money would you have to save to be trapped here for several years? And why buy it as an investment for breakeven cashflow? Oh yeah, the price will double in five or ten years, right? This entry was posted in Library, News on July 7, 2011 by IrvineRenter. The idea of overpaying for potential appreciation is one of the key ideas of the bubble. My wife and I save between 15-20% of our income per year, mostly into tax-deferred accounts. If our home was a better investment than what we can get in those tax-deferred accounts, why wouldn’t we take that extra 15% and put it towards our house payment? I think that is what a lot of people were doing during the bubble. We would be in a tough spot if that is what we did. If either of us got laid off, we could borrow against our accounts, or take a hardship withdrawal. We would first stop saving, and have that cash-flow available. The Banks as a group will not go bankrupt. If we rescued Citi again, we will not let them go down w/o some serious malfeasance. They have also built a good cushion of profits from the past couple years. The best you can hope for is the too-big-to-fails shrinking and other Glass-Steagall-esque limits placed on their activities. It might not be a bad idea to get a little counsel on the subject of “Tortious Interference.” Inducing someone to break a contract, even if the lender has recourse, is an offense. I don’t think you’re over the line here, but I’m not an attorney. It wouldn’t be a foolish move to go talk to one. I think the rules on this sort of thing require a specific contract rather than a general expression of the advantage of strategic default, but talking to someone who does this sort of thing for a living seems wise to me. I’m talking, IR/Larry knows me personally, and also knows he can call me any time. Generally, it’s not a good idea to encourage someone to break a contract because the other party to that contract can sue the “encourager” for damages. What protects IR here is he’s not advocating to a specific person regarding a specific contract- he’s just talking concept. Second, as a publisher he has a whole set of First Amendment protections. Still, in this day and age of ponzi, desperation and deception, it never hurts to be a little cautious. I wouldn’t put it past any number of entities to file a frivolous action against IR. I might add Embassy, that while IR is in the clear, your advice to him might represent the unauthorized practice of law. But don’t worry, Dave Ramsey does it daily multiple times to an audience in the millions. I don’t see how saying “I’m not an attorney” and “Talk to one” count as the unauthorized practice of law, and in general I agree with the “big picture” reasoning behind strategic default, but just because there’s a penalty in a contract doesn’t mean that encouraging someone to break that contract is necessarily legit. Might be, might not be – a good attorney can help you know where the cliff is. The owners of youwalkaway.com have based their entire business on encouraging people to default on their loans. So far they have survived any legal challenges. Plus, it isn’t breaking a contract when a borrower defaults. They are merely exercising a contractual right with consequences spelled out in advance. If the borrower defaults, the lender will exercise its contractual right to call the house to auction. Its similar to terminating a cell phone contract where the cell phone carrier charges a pre-negotiated fee for termination. Why is it called a “moral failure” or “deadbeat” when an individual excercise an default option in the contract and called “business accumen” when a business or business-man excercises that option? I don’t know who actually calls it business acumen except for non business folks or people who understand not a whit what they are talking about. If I hear of a business stiffing someone, I do not think of them of having business acumen. I think they are deadbeats, and I will hesitate doing anything on a non-cash basis with them as I am sure as do others. I wonder how long businesses that do not pay their bills stay in business. How long has Trump been around? Have you read up on the Apollo Investments of the world? These businesses stay around a long time. I know alot of corporate people that do and try my best to avoid working with them. The offices are filled with them and the modern business climate views Dale C’s methods as passe. I have a local observation which may relate to the lowering of the limit on GSE backed loans. We live in a “nice” area of Sacramento County, demographically the highest educated, but not the wealthiest by a long shot. Houses come on the market at numerous price points, but they eventually clear at about $440,000; that or go quietly away. Last year that price was about $550,000. Having lived in the neighborhood for over twenty years, these prices are still too high, based on salaries. It is obvious to me we are in for a further leg down, and the GSE support drop is merely a way point. Sacramento’s market is highly dependent on public sector jobs, so we will have about a five year head wind, after the rest of the state settles. Kid’s, hang on to your assets. thanks for the report from sacramento. always good to hear from long time residents. I live in a nice area, though a little less affluent that yours I suspect. Homes like mine have dropped 65% since the peak. I.e. a $500,000 purchase in 2005 is now worth $175,000. Knowing the Sacramento head winds and reliance on continually depressed state jobs, it is not brain surgery why people are walking. I’ve been reading (and sometimes commenting) on this blog since it started in 2006 and I was moving out of OC. It has been so interesting watching you think things through, IR, and witnessing the path your thinking has taken you. I don’t believe you could have written this article in 2006 (nor do I believe you would have thought it was possible). This crash has been so surprising to even those of us who anticipated it (I sold in Turtle Rock at the peak). I’ve very much enjoyed your commentary on the surprising actions of the banks and the public bailouts that are still occurring after all these years. I don’t know what is going to happen going forward, but I do know it is going to be interesting and I hope that you continue to comment on it. how does this imply anything about housing costs relative to rent? If someone was paying a premium for ownership relative to rent — which every owner was from 2002 on — then ownership needs to provide compensation in the form of appreciation to justify the increased cost. Further, the appreciation must exceed the loss of buying power from inflation. Those that obtained zero appreciation lost on both fronts: they paid a premium for ownership, and the money they got back at the sale had less buying power than the money they put into the deal. thanks for the explanation IR. Just hope that it’s not like the past class action settlement that counted discount coupons as part of the package. Lawyer got rich, distubitors got paid twice, consumer got the short end of the stick (since consumers were not directly harmed by the price fixing, they had no legal standing). IMHO, the consumers were the ones most harmed. The distributer just passed the increased cost to the consumers as a cost plus pricing. Many times settlements are used to protect the guilty. Fair enough, but a scale might add value. How far beyond rental parity should you be before it’s your moral imperative to stop paying? e.g. If your PITI+HOAs less tax-adjustment is 10% above comparable rent, is that sufficient? 20%? Where’s the line? And what if that amount you’re paying above comparable rent represents a very small portion of your monthly net income? e.g. If the difference between comparable rent and your PITI+HOAs less tax-adjustment is $250, and your monthly net is $7k, is $250 sufficient to stop paying? Yes, those are very tough decisions, and the fringes are all shades of gray. I suspect we won’t see much true strategic default in Irvine unless prices fall considerably more than they have so far. We will still see a lot of people default because they never could afford the payments. But for those who can afford the payments, they probably aren’t so far underwater to consider strategic default — except for perhaps the North Korea Towers. Some may have payments much larger than comparable rentals which may make them consider default, but if they aren’t that far underwater, I suspect most will hang on. Issues of morality get always tough because they tend to get cloaked in black and white. In this instance, there is a black and white extreme, but the middle gray area is pretty wide. With the economy as good as it got you have to expect bad things to be happening all over especially with loans. Here it is folks!!! More stupid from gobbermint. Whhhhaaaa!!!!!! I want my gobbermint cheeze, but stupid me, I RENT!!!! Will the Awebamma give renters free rent for a year too???? Long time lurker, first time poster. Absolutely love this site, and it’s insight. But did anyone see this article. Another kick to the crotch of responsible renters. I don’t see anyone landlords pushing off rent payments if their tenants lose their job. I ACTUALLY LOOK FORWARD to the day this phoney economy, and government crap just IMPLODES! And I wish for it to happen NOW, rather than 10 years from now. This road to HELL is paved with “good” intentions for sure. Amazing how time can change one’s tune isn’t it? I made all these points 2 years ago when I entered the market of strategic default. I’m still in my home, but I’m one of the very FEW who not only qualified for HAMP, but am actively modified and paying a monthly nut. Granted, there was ZERO principal reduction (my $100,000 buffer was the large chunk of that) so I *will* default again in the future. Yes, people called me evil and selfish, and can’t see the forest for the trees. Anyone in similiar circumstances with an OUNCE of financial sense for their security, will default before 2012 to avoid taxes. Have I ever seen an article that addreses this? Watch the default rate skyrocket as people realize they will be taxed on the losses. I lost $100,00 of my own money, do I get a tax dedection? Yea, that’s right the answer is no. F the banksters, and the politicians, from this day forward, I do what I can that’s in MY families best interest, good luck to those trying to peddle guilt. You can consider me one of the new age anarchists, I follow the laws I deem right, not what the gov passes or enforces. A wise man would live the same without laws. Agreed. Personally, I was called a thief and a deadbeat after I defaulted on my 400K Chicago home and it’s 3k monthly payment. Now it seems, everyone is conceding that default if not a moral obligation, is a financially prudent act. So my next question is, if the bank will not evict me, so I am forced to squat since I am still responsible for the condition of the property, how is squatting an immoral act? I am not stealing. I am legally responsible for what happens to my home until the bank evicts me via foreclosure. I received a HAMP mortgage modification from Wells Fargo in December 2010 after a 3-month trial period. There was no principal reduction. They simply refinanced me from my 5.625% mortgage to 4.375% (the prevailing 30-year mortgage rate at the time), kept the original loan maturity and started monthly impounds. While I am underwater about $70k, I am not going to strategically default, because I believe that getting back in a few years down the road (I would do a short sale, not a strategic default if there’s a difference) will be much more costly given where I beleive mortgage rates will be at that time. In addition, I likely won’t have the 20% down payment that will be required and the $300 I would save monthly from renting could easily be eaten up by a rent increase (inflation). I’ll stick with my fixed mortgage payment. Good luck to all. Thanks for sharing your anecdote. So saving up 20% will be that much easier. Thanks for your input. While house prices should decline if interest rates increase, saving a 20% down payment while renting will not be easy if the increase in interest rates is caused by commodity inflation, making it more difficult to save a 20% down payment as cost of living increases (food, energy, etc.) are not matched by wage increases. This is called “screwflation,” as the Federal Reserve prints money devaluing the USD currency through QE. This is one of the reasons Obama released oil from the SPR, and increased margin requirements on certain precious metals, although both will prove to be only a short-term reprieve against ever rising prices in my opinion given the growing global demand for these commodities. I have held a theory that the class of people who lived high on debt would be the last to fall. These are a group smart enough to manipulate bankers into continual refinancing. For example, I have a friend who has 2 Mercedes, a racing Porsche and a Lamborghini. He lives in a very exclusive neighborhood and also has a beautiful summer home. Everything is financed. He lives paycheck to paycheck and the checks have been shrinking. There is no longer any place to get more refinancing. It’s just a matter of time. I live in a very modest home with 3 vehicles. The newest is a 2000. I also have substantial savings. My net worth far exceeds his. What a ridiculous world.